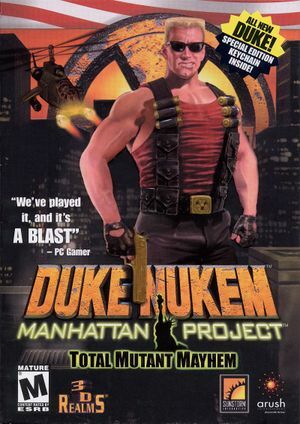 This game is no longer sold digitally for Windows. Native for Steam; see Widescreen resolution for other versions. 50° horizontal by default; see Widescreen resolution. Set in the launcher, toggle in options, or use Alt+↵ Enter. 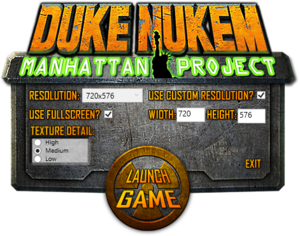 The Steam version supports custom resolutions in the launcher. 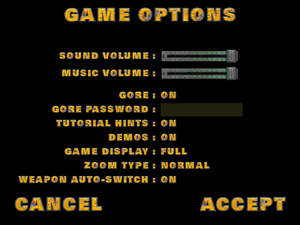 Use these steps for non-Steam versions. If the game is showing the launcher on startup, check the box to skip it then run the game and exit. Change uset r_mode to the resolution you want. Add the line uset g_cam_fov "90" with the horizontal FOV you want (default is 50). Make the file read-only (this prevents the FOV line being removed when you exit the game). The HUD and all other 2D elements are stretched from 4:3. Mouse cannot be used in normal play. Can't bind a menu button. Can't bind axes as buttons. Cannot bind triggers or right stick. 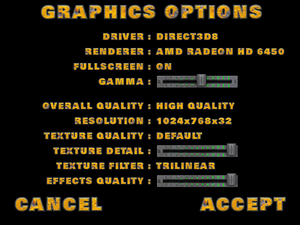 OpenGL setting required when double jump does not work in Direct3D mode. ↑ 3.0 3.1 File/folder structure within this directory reflects the path(s) listed for Windows and/or Steam game data (use Wine regedit to access Windows registry paths). Games with Steam Cloud support may store data in ~/.steam/steam/userdata/<user-id>/240200/ in addition to or instead of this directory. The app ID (240200) may differ in some cases. Treat backslashes as forward slashes. See the glossary page for details.